Expression of the SIINFEKL/Kb complex by DC incubated with CD4+ T cells recognizing their cognate Ag. A, B6 DC were incubated with or without 10 μM free SIINFEKL. After an overnight incubation, cells were incubated either with pan Kb (5F1) or Kb/SIINFEKL-specific (25-D1.16) mAbs before washing and staining. B, Percent of binding of 25-D1.16 to DC incubated with different concentrations of free SIINFEKL, relative to binding of 5F1 mAb. C, DC were incubated for 24 h, alone or with the indicated concentrations of free OVA, free SIINFEKL, OVA in DNP-bearing liposomes without (Lipo OVA), or with 5 μg/ml anti-DNP (FcR Lipo OVA). They were then incubated for an additional 24 h in the presence or absence of Th cells from OT-II mice. DC were then stained for 25-D1.16 and 5F1 mAb binding and results expressed as the percent of Kb/SIINFEKL complexes as compared with total Kb molecule expression. Results are representative of two experiments. Error bars in this and subsequent figures represent SD of the mean for the experiment presented. MHC class I-restricted presentation of FcR-targeted exogenous Ag to CD8+ T cells by DC is induced by CD4+ T cells recognizing their cognate Ag. A, DC were incubated with different forms of Ag as described in Fig. 1C. The concentration of all Ag was 10 nM. After overnight incubation, they were also incubated with 2 × 104 Kb/SIINFEKL-specific T cells from OT-I transgenic mice, in the presence or absence of T cells from OT-II mice. After 24 h incubation at 37°C, activation of the OT-I T cells was revealed by CD69 expression of CD8+ T cells. The number expressed as a percentage refers to the fraction of CD8+ T cells that are CD69+. Histograms represent data from 50,000 cells. Results are representative of three experiments. B, A total of 2 × 104 DC were incubated with different forms of Ag at different concentrations. After an overnight incubation at 37°C, cells were washed and incubated with 2 × 104 OT-I alone (right panel), or in the presence of 104 OT-II (left panel). CTL activity was determined after 5 days. Curves show the results of one experiment, representative of results of five independent experiments. Induction by CD4+ T cells of MHC class I-mediated presentation of exogenous Ag by DC is proteasome- and TAP-dependent. A, A total of 2 × 104 DC from B6 or B6 TAP1−/− bone marrow were incubated with 1 nM free SIINFEKL or 1 nM OVA encapsulated in DNP-bearing liposomes targeted to the FcR by anti-DNP mAbs, alone or together with 1 nM of the proteasome inhibitor MG-132 for 1 h at 37°C. DC were then washed and incubated with 104 T cells from OT-II and 2 × 104 T cells from OT-I mice. Cytotoxicity was evaluated as described in Fig. 2. B, DC were incubated with serial dilutions of FcR-targeted liposomes containing OVA with or without 1 nM proteasome inhibitor, or with untargeted liposomes, as described in A. 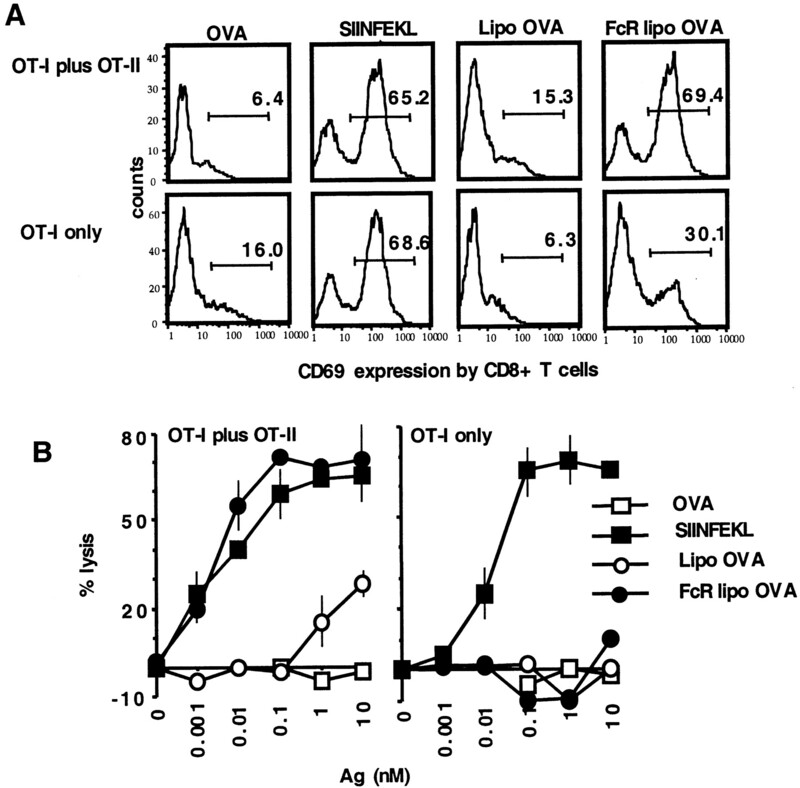 Cells were thereafter incubated with 2 × 104 T cells from OT-II mice. IL-2 secreted by Ag-specific CD4+ T cells was measured after 48 h. Curves are representative of results obtained in two experiments. Most of the activity of CD4+ Th cells can be explained by their direct effect on presentation of exogenous Ag by DC. A, A total of 2 × 104 DC from (CBA × B6)F1 mice or 104 DC from CBA plus 104 DC from B6 mice were incubated with different concentrations of OVA contained in DNP-bearing liposomes in the presence of 5 μg/ml of anti-DNP mAbs and 100 nM free HEL. After an overnight incubation, cells were washed and incubated with 104 HEL-specific CD4+ T cells from 3A9 mice and 2 × 104 CD8+ T cells from OT-I mice. After 5 days of culture, CTL activity against SIINFEKL-pulsed RMA target cells was read. B, A total of 2 × 104 DC from (CBA × B6)F1 mice or 104 DC from CBA plus 104 DC from B6 mice were incubated with various concentrations of free HEL. After an overnight incubation, cells were washed and incubated with 104 HEL-specific CD4+ T cells from 3A9 mice. IL-2 secreted by 3A9 T cells was measured after 48 h. C and D, Different numbers of (H-2k × b)F1 DC were incubated alone or with 10 nM OVA in DNP-bearing liposomes with 5 μg/ml of anti-DNP mAbs in the absence or the presence of 100 nM free HEL. After overnight incubation, cells were washed and incubated with 104 HEL-specific CD4+ T cells from 3A9 mice, and 2 × 104 CD8+ T cells from OT-I (C), or from KB5C20 (D) mice. In control experiments, 10 μg/ml anti-Kb (5F1) Ab was also added. Cytotoxicity was after 5 days of culture for T cells from OT-I mice or 3 days for T cells from KB5C20 mice as in A above. 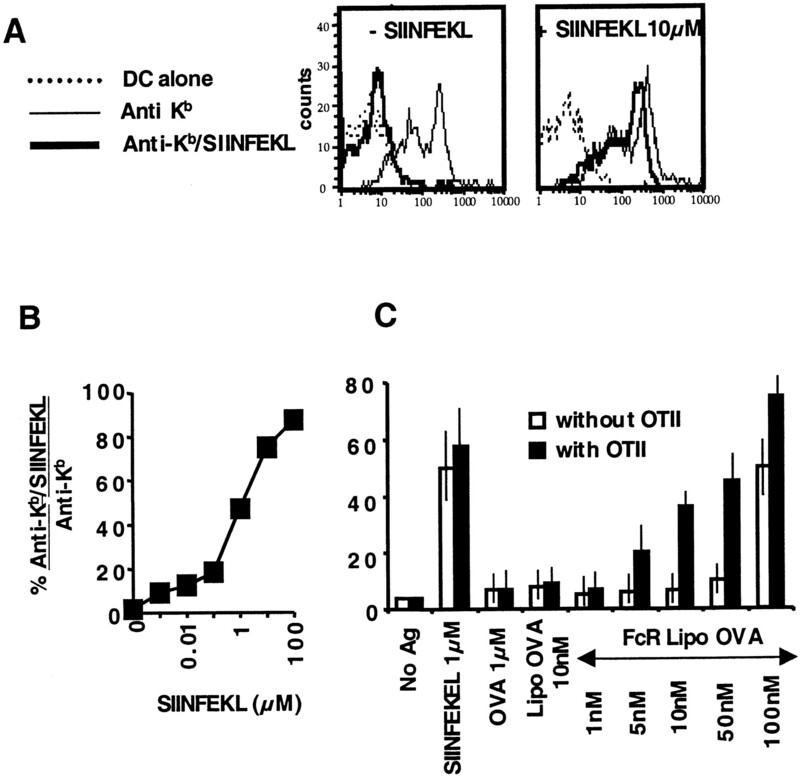 SIINFEKL-pulsing of RMA cells did not affect lysis by KB5C20 cells. Curves are from a single experiment representative of results obtained in five experiments. Induction of cytotoxicity depends on the manner in which class II-peptide complexes are formed. A, A total of 2 × 104 (H-2k × b)F1 DC were incubated with 1 nM OVA contained in FcR-targeted liposomes, alone or with 100 nM free HEL, or with 100 nM free HEL46–61 as indicated (left panel); with 1 nM OVA and 46–61, both contained in FcR-targeted liposomes, without or with 100 nM free HEL46–61 (right panel); or with 1 nM SIINFEKL without or with 100 nM free HEL46–61, (inset in right panel). After an overnight incubation, cells were washed and incubated with 2 × 104 OVA-specific (OT-I) and 104 HEL-specific (3A9) T cells. After an additional 5 days of culture, cytotoxicity was determined as in Fig. 2. 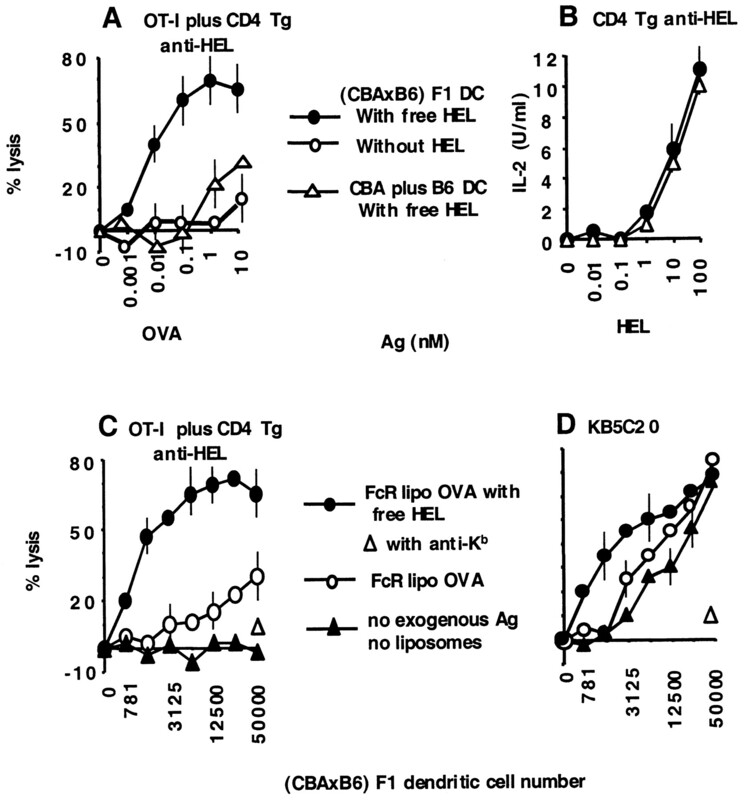 B, left panel, A total of 2 × 104 (H-2k × b)F1 DC were incubated with different amounts of free HEL or HEL46–61 and 2 × 104 3A9 T cells were added for 48 h and IL-2 was measured as described in Fig. 4. B, right panel, Percentage of 3A9 CD4+ T cells positive for CD69 after 24 h incubation was evaluated with PE-labeled CD4- and FITC-labeled CD69-specific Abs. The number expressed as percentage refers to the fraction of CD4+ T cells that are CD69+. CD4+ T cell activation of DC that endocytosed Ag can be inhibited by treating DC with MCD but not with dilute Triton X-100. A, A total of 2 × 104 (H-2k × b)F1 DC were incubated with the indicated concentrations of free HEL or HEL46–61, or OVA and HEL46–61 coencapsulated in FcR-targeted liposomes. After overnight incubation, they were washed and treated with different concentrations of Triton X-100 for 30 min at 4°C, or with indicated concentrations of MCD in complete medium for 1 h at 37°C, before re-washing and addition of 2 × 104 HEL-specific CD4+ T cells. After 48 h incubation, supernatants were harvested for IL-2 determination, as described in Fig. 4. Data are representative of those obtained in five different experiments. B, A total of 2 × 104 (H-2k × b)F1 DC were incubated overnight with 1 nM OVA and HEL46–61 contained in FcR-targeted liposomes (left panel), or with 1 nM free SIINFEKL (right panel). Cells were then untreated or incubated with 5 mM MCD for 1 h before addition of OT-I T cells with HEL-specific 3A9 Th cells. Representative of five experiments.